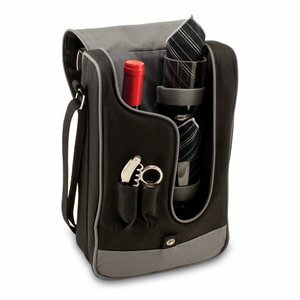 The Barossa is so sleek and sophisticated, you'll want to take it with you every chance you get. 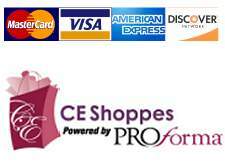 It's made of 600D polyester and features an adjustable shoulder strap that makes it easy to carry and a flat zippered pocket on the exterior flap. The Barossa is fully insulated to keep your wine the perfect temperature and has a divided interior compartment to separate your bottle of wine from the 2 (8 oz.) acrylic wine glasses included. Also included are: 1 stainless steel waiter style corkscrew, 1 bottle stopper (nickel-plated), and 2 napkins (100% cotton, 14 x 14in, Black with silver pinstripe). 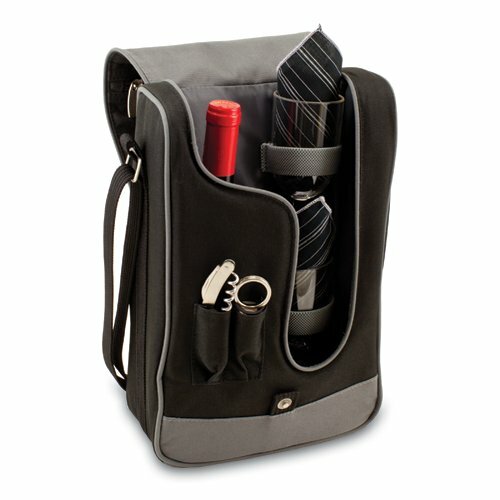 The Barossa wine tote is perfect for picnics, concerts, or travel and makes a wonderful gift for those who enjoy wine.